I don’t write reviews often, but this model I felt needed one for many different reasons. Mainly because I thought it deserves an honest and unbiased presentation. 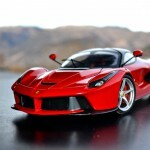 I am not going to bore you to death with the all very known facts and statistics about the real car and its performance. This is going to be purely about the model and its many positives and negatives. And there is plenty on both sides of that fence. First let’s put up some pictures to enjoy. At this point I would like to say, that the model displays very well and it seems to be very well made. The proportions are dead on. The ride height is correct and the dreaded Mattel problem with wheel/tire size (whether a legend or fact) is non-existent. At this point I would like to address the hinges. I am doing this at this point in the review, because I don’t consider them a plus or a minus. Yes, they are all of the dogleg type. Well, kind of. 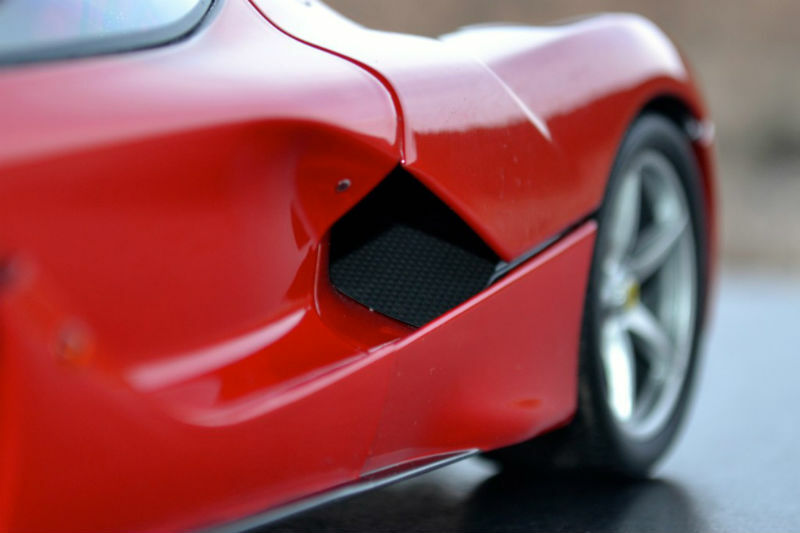 The rear hood hinge is the kind that slips/slides. Although of the dogleg variety, it creates a really cool movement to the engine lid. Is it 100% prototypically correct? No. But when handling the model, you can’t see it at all. It feels solid and works just fine, and same goes for the front hood hinge. The hinges on the doors are doglegs on the real car too. The problem with Mattel comes from the top ones. They operate just fine, but are held in place by the headliner piece, which is bolted down the center with two screws. When the doors are closed (or open for that matter), the problem is not as much with the doglegs, but with those unsightly screws and their surrounds. This sounds really bad, but in fact it is absolutely unnoticeable when the door are closed and you really need to be looking for the issue to see it with the doors open. Now that we are over the doglegs and the wheel size, the only other thing someone mentioned were the mirrors. Are they too angled, too high, too low? Honestly, they look really awkward on the real car and equally weird on the model. I personally have no issues with them. So, on with some more pictures. The interior is faithfully represented, with well done details. The door pulls, knee padding, lower dash and the seats are all red, which imitates leather with conviction. The interior tub is a strange mixture of raised “carbon fiber” molded in places, while the majority of the interior is simply painted in “carbon color”. The elbow rests and the panels where the side airbags are on the real car are very nicely done in textured black, which mimics alcantara. There are also the floor mats, which are just painted semi-gloss black to copy the rubber ones in the real car. Most of the interior door panels have molded in carbon fiber. It is an unorthodox mixture of finishes, but it works very well together. The only slight let down are the seats. they are very well done and have accurate shape and proportions. What irks me about them is the trim. All those black lines in them are thin strips of leather on the real ones. On the model they are not molded in and then painted, but are represented with black decals. This works just fine if you take the model out of the box and put it on the shelf. But if you like to repaint the seats beige and add dark blue accents, you are left with nothing once you strip/spray them. The only problem is that they should be the other way around. And this is not a quality control issue, a defective model, bad luck or anything of the sort. This is a mistake made during the designing stages of the model. All of them are made this way. 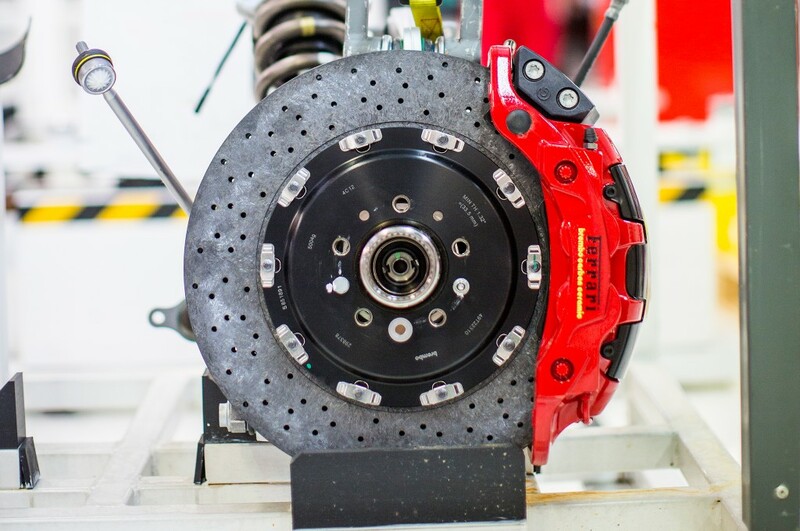 What is worse is that because of this mistake, it creates the illusion of the brake discs to be too small and they are not. 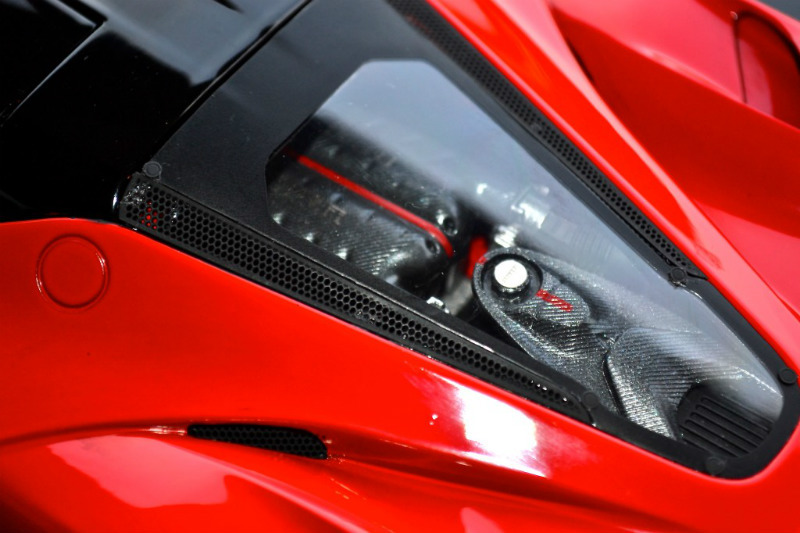 The LaFerrari has unique and very complicated headlights, which although familiar looking, are different from any other modern Ferrari lights. I think Mattel just plain dropped the ball here. They are not very well detailed and the first word that comes to mind is “cheap”. 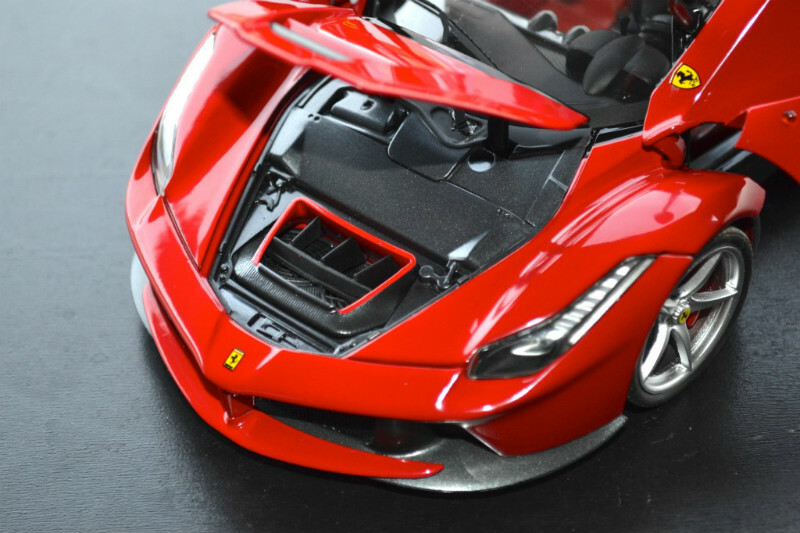 One of the first things you will notice is that the panel gaps we got spoiled with from F12, FF, 599XX etc., releases have given place to bigger and more inconsistent ones on this model. 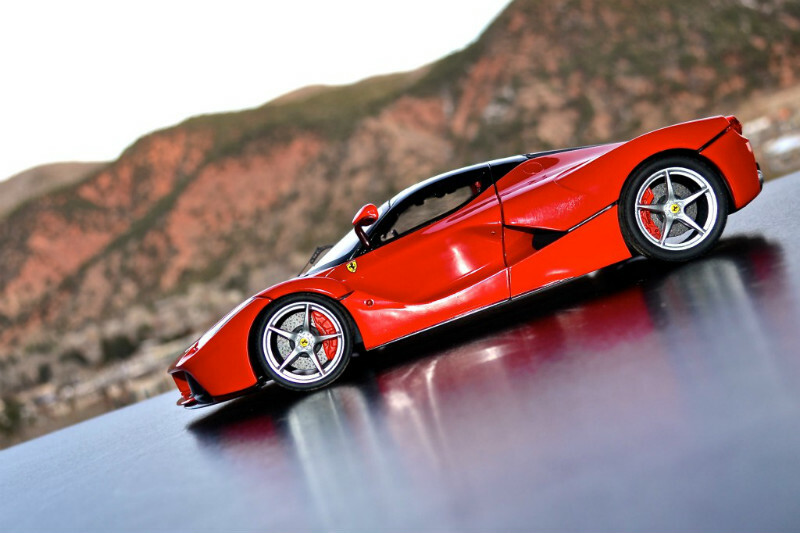 I am pretty sure that a lot has to do with the very complex shapes of the car and the limitations that come with a fully open diecast model. But still, I think a little more effort would have paid off. And then there are the join-lines. Here we have to show understanding, as these are inevitable. There are just some shapes and forms that are impossible to make in a single piece. 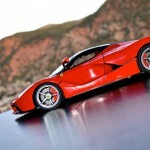 To drive the point home, I want to say that I am also building two LaFerraris in 1:24 scale, one from Tamiya and one from Revell. The engine cover on the Tamiya kit consist of 5 pieces that need to be glued together. The main hood and four separate pieces – one for each complex vent. Revell gets away with three pieces, but the shape is not as perfect as Tamiya’s at the end. 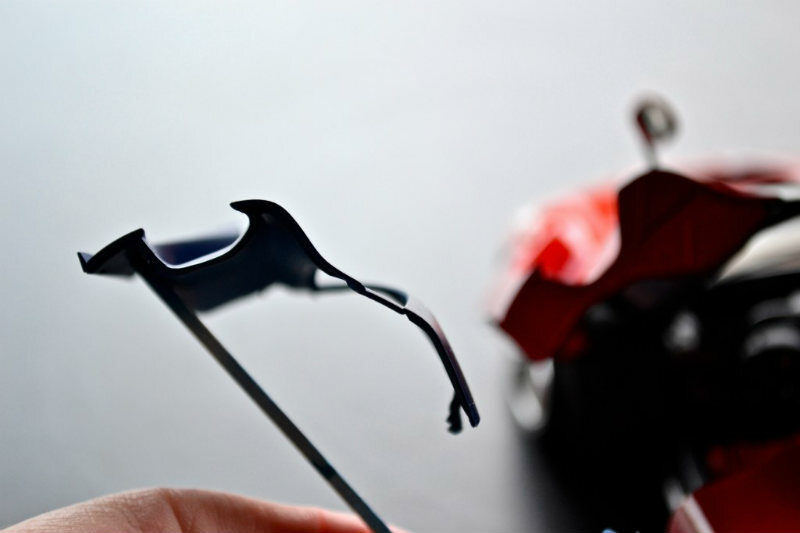 Mattel’s hood is made the same way as Revell’s – in three pieces. What bugs me though, is that they seem to have painted the pieces separately and then assembled them, which created a very prominent join-line. The doors on the Tamiya’s plastic model are composed of three separate pieces (just the outside skin). Mattel got away with only two pieces and the join line is very well placed, but still – pretty well visible. This brings me to the only major issue I have with the model – the side intake shape. 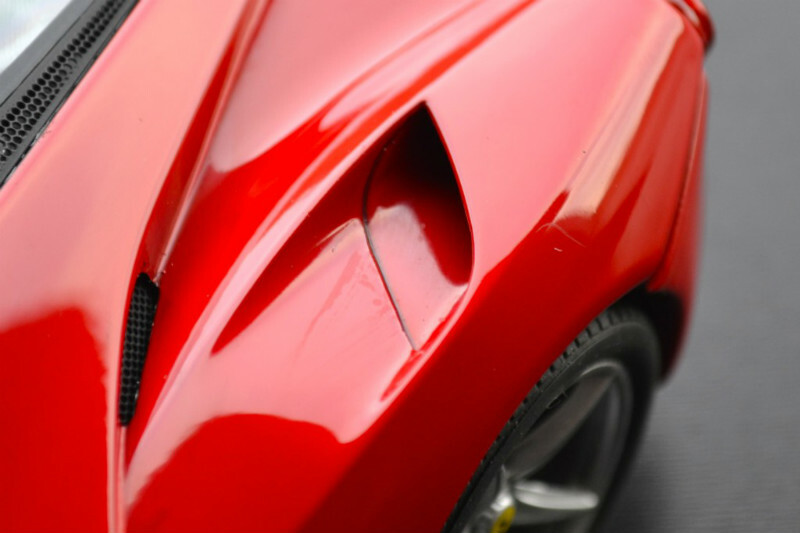 The doors on the real car have extremely complex shapes. On the front they extract air from under the car and on the rear they guide air in to the oil coolers. As mentioned earlier, Tamiya had to make no less than three pieces to make that shape. Honestly, I don’t see how anyone could recreate this shape with any less pieces on an opening door. The problem, however, is that if Mattel made it from three pieces, they would all leave join lines. And sometimes you just have no way of concealing them. So Mattel bit the bullet and made a compromise and built them in two pieces. As a result, if you put the model at eye level you will see a change in the shape of the intakes compared to the real thing. This is caused by the undercut of the door, which is wrong, but there is no other way around it without adding another piece to the assembly. This model suffers from a problem I have seen on models from many other manufacturers, both high end and budget – color separation. This is the line where one color is sprayed over another. It is caused by the use of templates instead of masking (cost-saving). The black flap on the hood has about 1mm bleed over the red. The black lips on the bottom of the doors are inconsistent as well. This picture shows a total lack of color on the bottom center of the car, where the small panels on each side of the “cell phone” fog light should be red and on the model they are molded together with the diffuser and are the same black color. The same picture also shows total lack of Carbon on each side of the license plate. 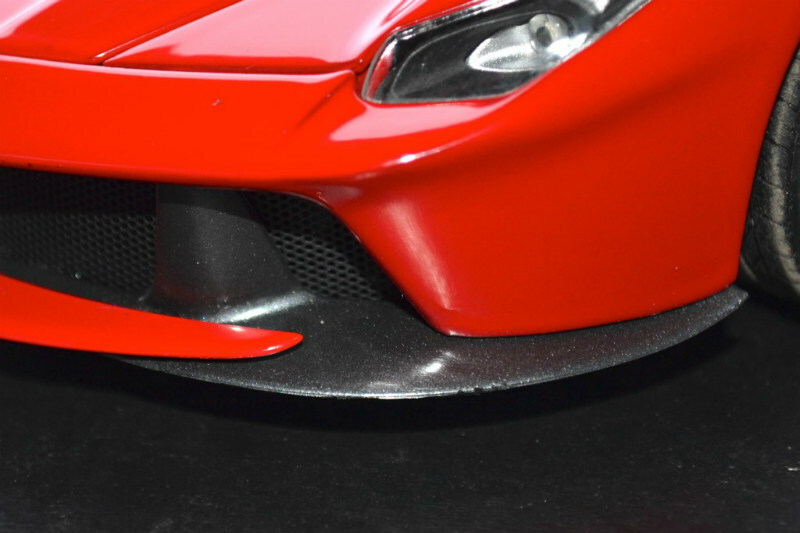 Speaking of which, there is nothing but color to suggest any carbon fiber in the area of the nose either. Most of these issues are pretty minor and most collectors will be just fine with them. And the only serious thing (the door shape) is pretty understandable, as it comes from necessity rather than negligence. Now on to all the good things, which still make this model worth every penny it costs. …to the engine cover, where not only the side screens are photo-etched, but also all the details on the window. The rear bumper, where beside the grilles, we find a nice emblem, license plate, and marker lights. I did not take pictures, because it would be almost impossible, but there are numerous emblems, plaques and details throughout the interior, all done in PE too. Yes, I know I already mentioned the brakes in “the bad”, but besides their misplacement, which I haven’t tried yet, but believe would be easy, are very well made. The shading on the discs is spot on for carbon ceramic brakes and the calipers are just fantastic. 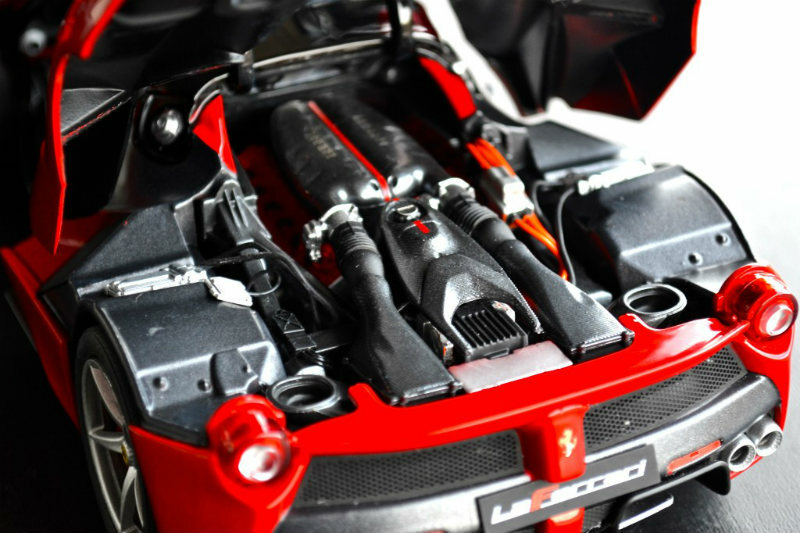 The engine is definitely one of the strongest areas on this model. it has all the hardware visible in pictures of the real engine compartment and quite a lot of wiring. The exhaust manifolds look wonderful, at least from what can be seen. 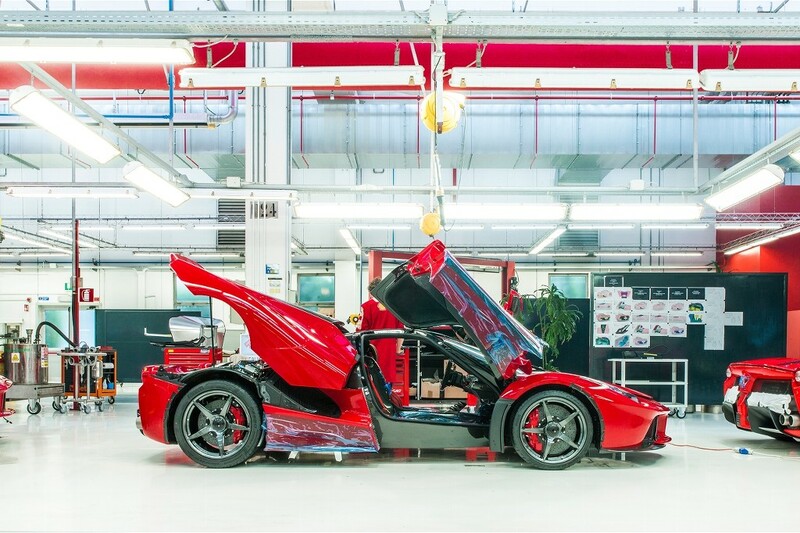 Just like the interior, there is a variety of finishes created by different patterns, carbon molded in some parts, and the clever use of color. 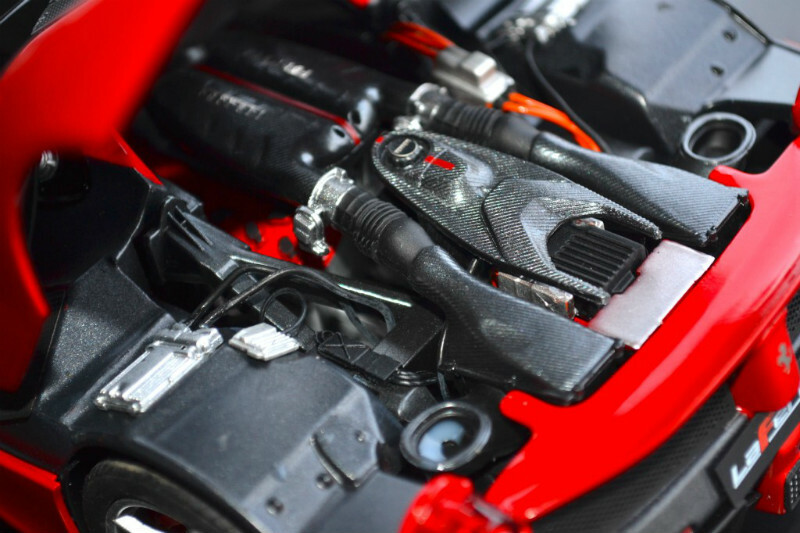 The only thing that puzzles me is that they did not wire the spark plugs, like on their previous models, but did pretty much everything else. And YES, I saved the best for last. The active wing is functional. In conclusion, I really like the model. Is it Mattel’s best to date? No way. Is it worth buying? Absolutely. Would I spend the premium price to have it a month early? I don’t think so. It has flaws and it is not perfect. But then again, no model is. A lot of the issues can be fixed by an experienced person and some are so minor that they are not worth dealing with. 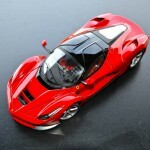 Overall, it is a great effort and it holds its own on the same shelf as some high end models. 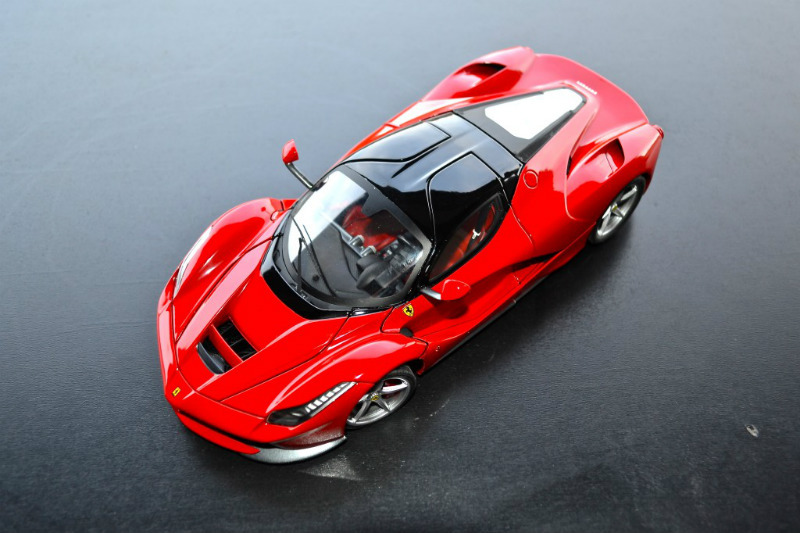 However, this is one of the very few times that I can say, if you want the best LaFerrari in 1:18, either have this one reworked, or go resin. 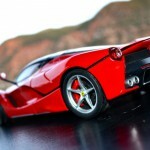 29 Responses to "REVIEW: Hot Wheels Elite Ferrari LaFerrari"
I have the BBR version and I am very happy with it! Thank you for this in-depth review of this much anticipated model. 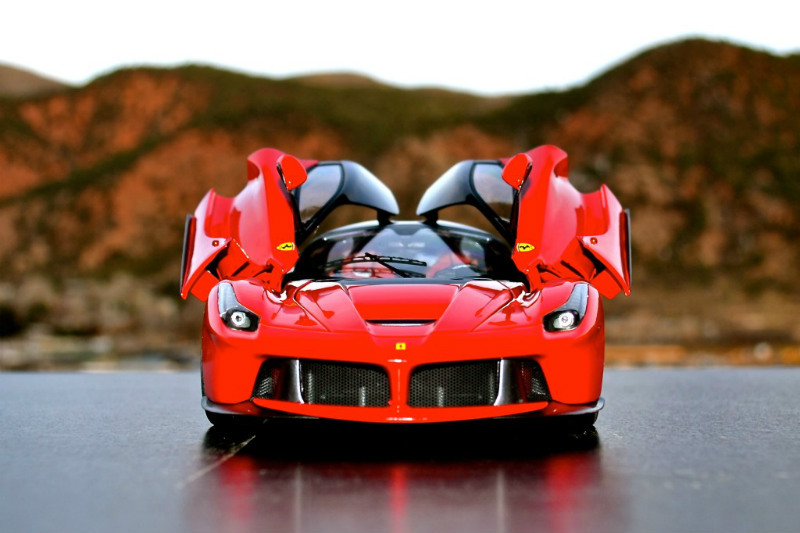 Now, there is someone who has studied the LaFerrari shapes thoroughly. I absolutely agree that it´s good value for its money (except for the stupid rear brakes mistake). Resin ones avoid many of the tricky bits by keeping the model shut,but create new ones with that at the same time: The 1:1 does have a rather wide shutline around the engine cover which are replicated by BBR by simply painting it black. Similarly, the rear lights seem to be “floating” on the 1:1 which is much better replicated by mattel than BBR. 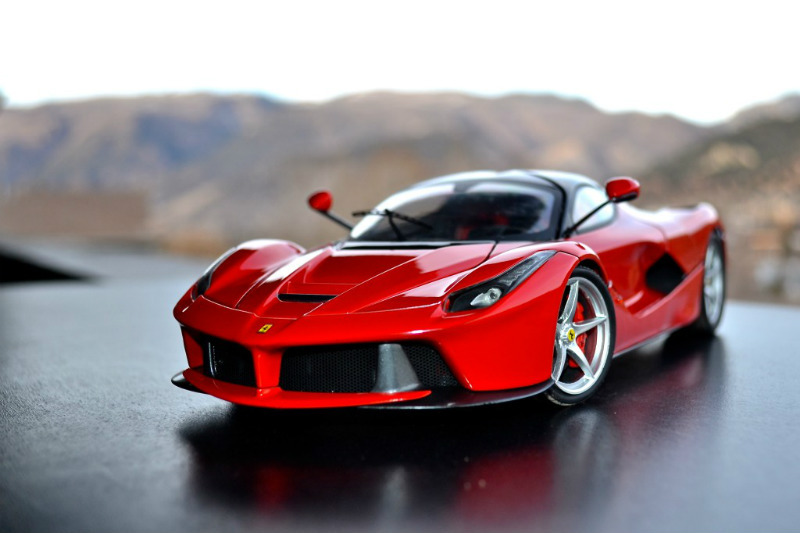 So thanks to Lucky13 I do not regret having pre-ordered the Mattel Elite and (may be after improving it) will happily display it alongside the Elite 288 GTO and Kyosho´s High-End F40. Well the real car does not have a very wide shut line on the hood. 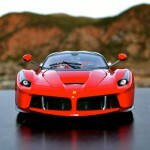 It has a character line just like the F40 and F50 before it (absent on the Enzo). It is actually a recessed black line. It is faithfully represented on the Elite model. It is not just a gap. It is also correct on the BBR models where it is just painted black, like on the real thing. When talking about big panel gaps, I was talking about the ones between the front bumper and the rest of the body, around the front hood and hoe the doors line up with the rest of the body. A lot of it has to do with the thick paint, but not only with that. The tail lights do “float” better on the Elite than on the BBR indeed. What I was trying to highlight is that the “character lines” must be somewhat recessed on the real vehicle. From an angle you can see through what I meant by “gap” and see the rear lights. Further down in the comments there are two pictures of both the Mattel´s and the BBR´s rear (brakes discussion). 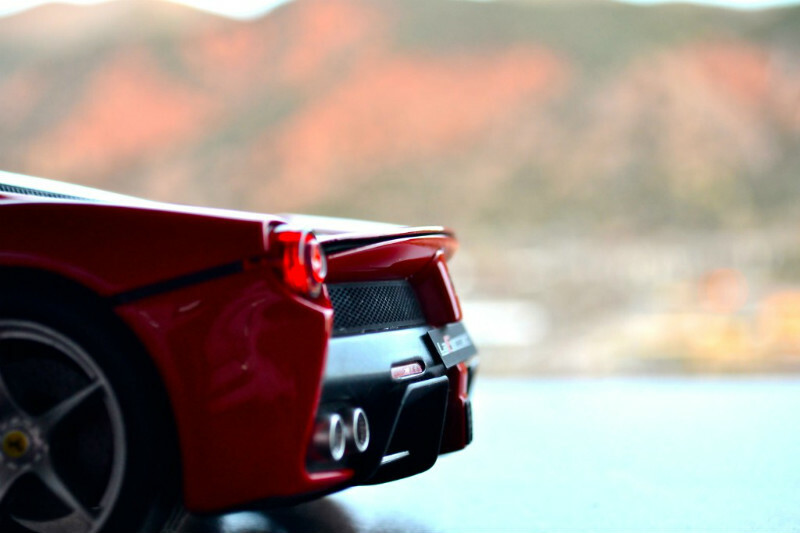 In one you can see the tail lights, in the other you don´t. I am not losing anything. To some people details matter, to others they don’t. I just made an honest review showing the strong and the weak points of the model for people to see, without being biased toward the subject matter or the manufacturer of the model. From here on, people can decide what matters to them and what dos not. I have been enjoying my models for well over 20 years, no matter what I spend. If you want to give me a tip, you can send me $5. I don’t see the problem with the brakes. I’ve compared pictures of the real thing and they look correct. 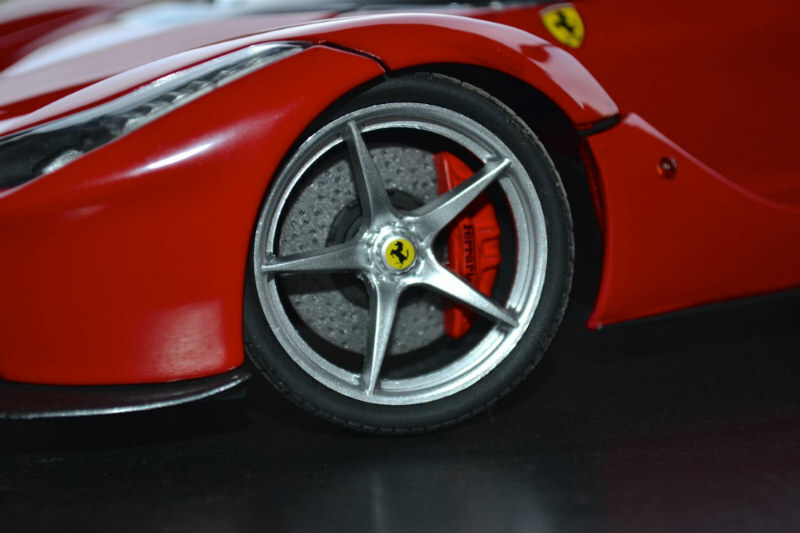 Correct size/diameter and positioning of the callipers. What do I overlook? There is a problem with the brakes. The front brake CALIPERS have a very specific design and a re bigger than the rears, just like on every other car I have seen. 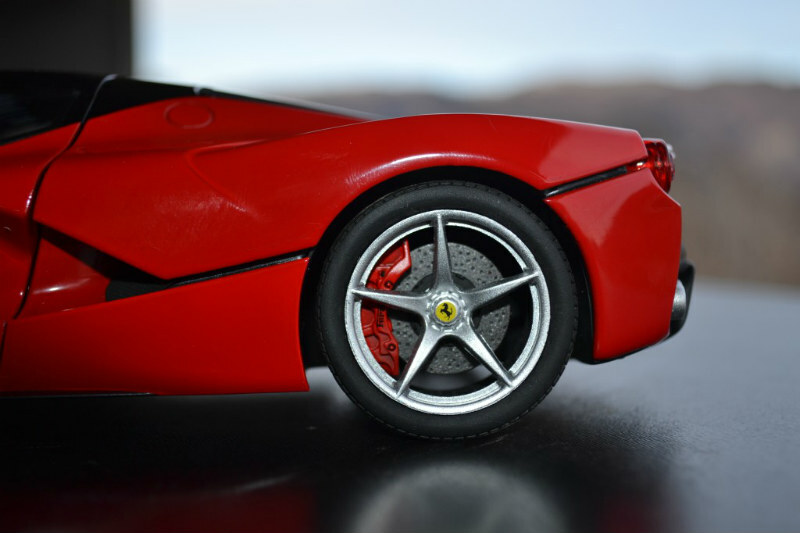 Mattel put the front brake calipers at the rear and the rear brake calipers on the front. I hope you see what I am talking about. The front brake disc is ‘straight’ and the rear curved. Top picture is real car and the brakes are not straight (hidden by spoke) and the bottom picture is computer generated as I said, from the promo pictures before the car went in production. Wrong! The pictures you have posted are of the Geneva presentation car, which has quite few differences with the production car. The Geneva car was one of the test mules and it is actually an Italia and it caries Italia VIN number. The wheels are not exactly the same, quite few things under the hood, the seats etc.. The pictures I provided you with are from the assembly line. 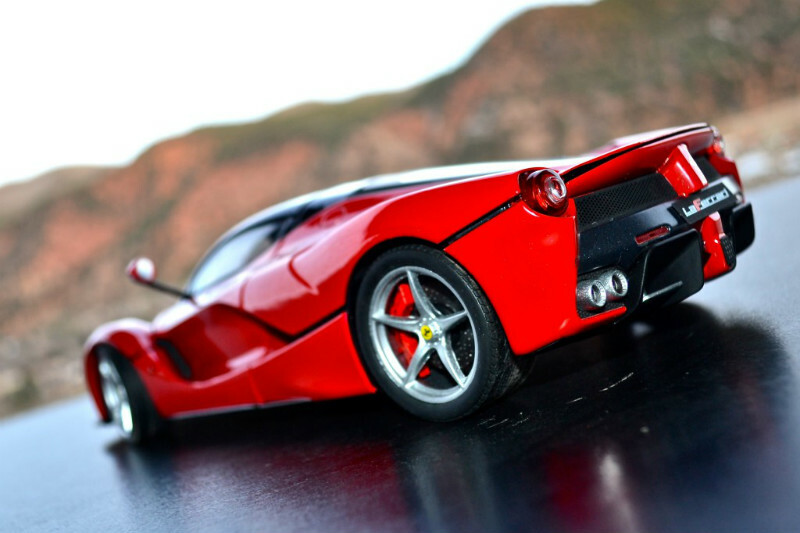 Now here we have a case that we have seen before with Hotwheels’ Enzo and Bburago’s F40. All of these models were developed together with the real car. So they carried over details from the prototypes. 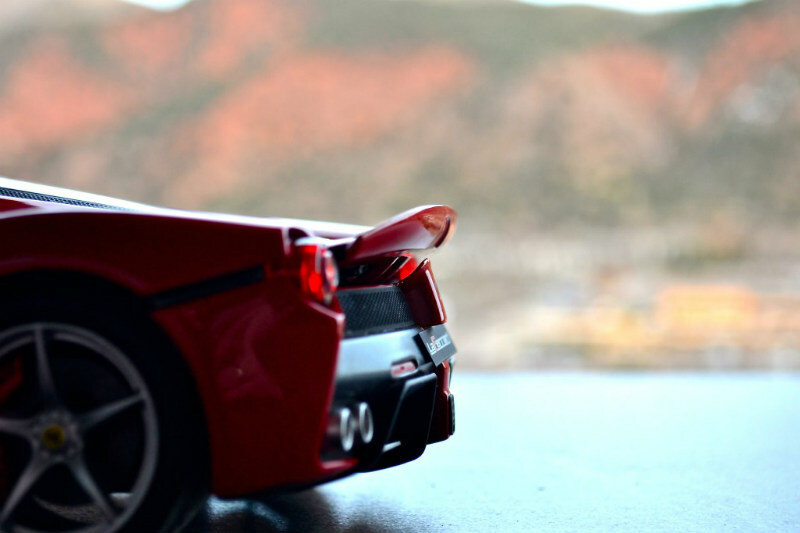 Bburago’s F40 is absolutely accurate. 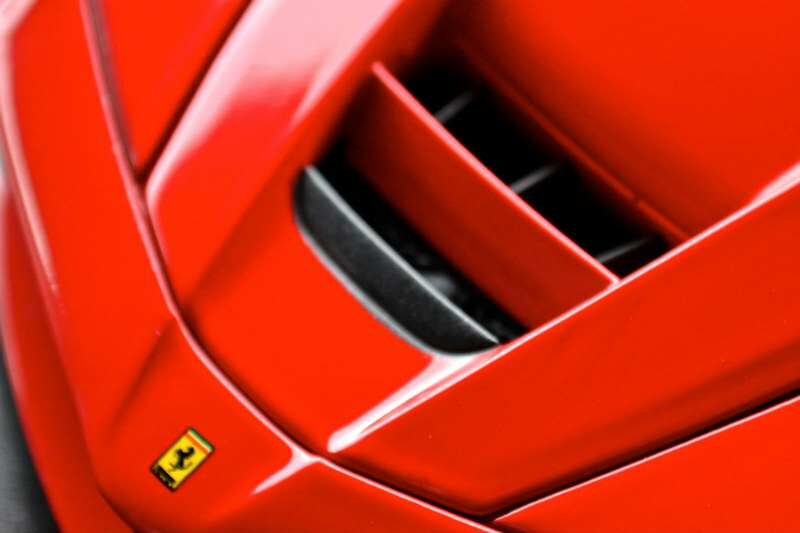 The engine intake, the different number of slats on the fenders and the rear glass, the seats……..are all correct to Enzo Ferrari’s personal car, which was the last of the prototypes. 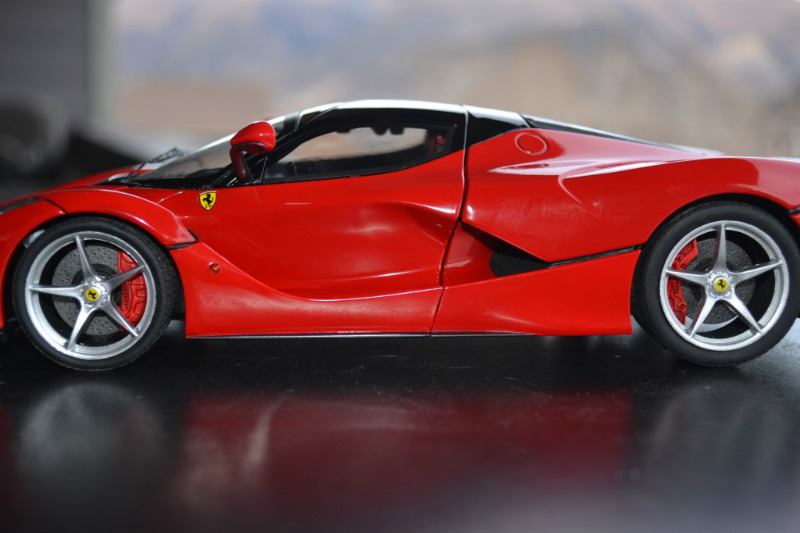 The first release Enzo models from Hotwheels had an engine cover that many thought was wrong, but actually is correct to the 348 based mules and to the first Enzo prototype. 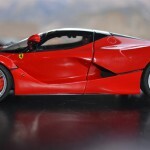 Mattel later fixed it and later releases of the Elite Enzo have the correct engine. Same thing with this model. It has the brakes from the press car. 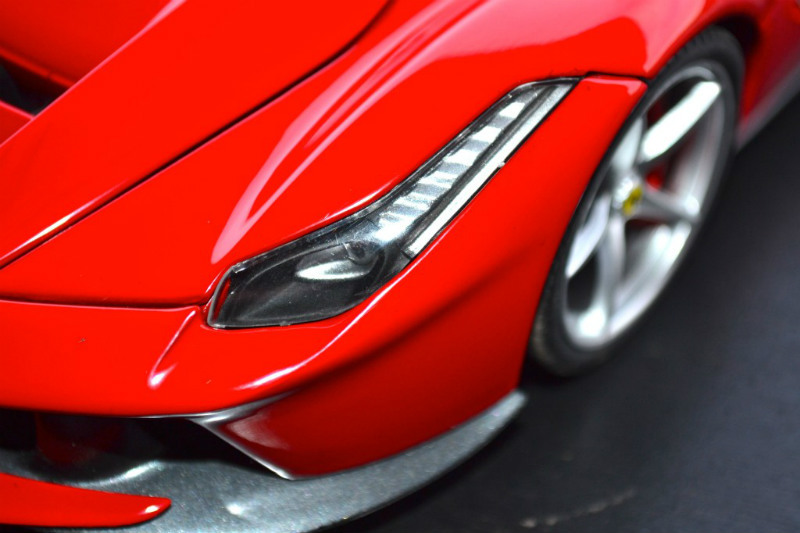 Because models take a really long time to develop, they start them in secrecy, before the real car is released. 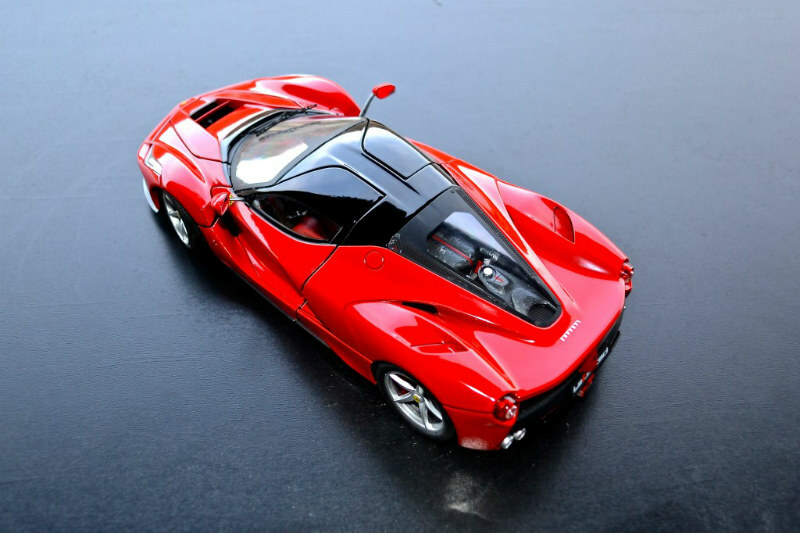 The problem here is that both the Bburago F40 and the HW Enzo were released as models together with the real car, while with the LaFerrari Mattel had more than enough time to address something like this. not to mention that the last picture is computer generated image and not a real picture. Anyway, I am nitpicking. The brakes are probably fine with the majority of collectors, but I am changing them on mine. You’re wrong. That closeup shot you posted of the ‘front’ brake is 100% a closeup of the rear brake assembly! 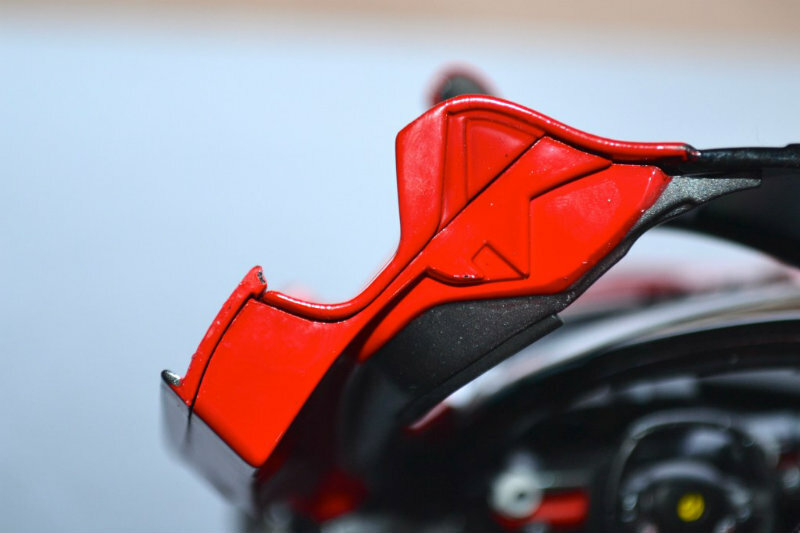 The worst you can say about mattel is that they may be lacking some details of the production spec front brake caliper, but that is all. There haven’t been switched. I’m super late to the party on this argument but BRUCEA you are 100% correct. 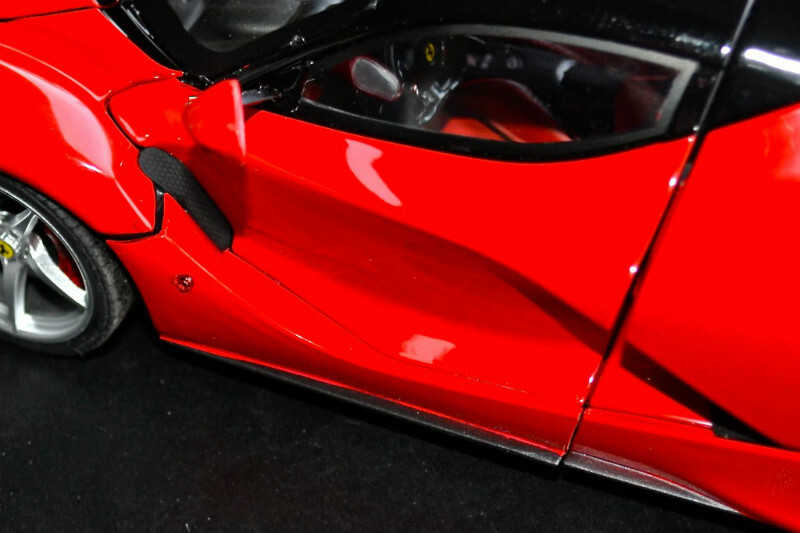 The LaFerrari’s rear calipers are more of a Banana shape while the fronts look more like a half moon (or 1/3rd of a moon). I have this model and Hot Wheels did a great job on them…..yes there could be more detail but the overall shape is correct. I think Michael is mistaken on this one. Thanks for the review. Really helps when purchasing a model online. Guys any idea what website is this available on ? Most retailers will see this model in the early new year. There are some with the product in stock. Check out ‘LINKS’ page for various retailers or search eBay. Good luck! Oh okay thx, I already checked out a couple of sites. 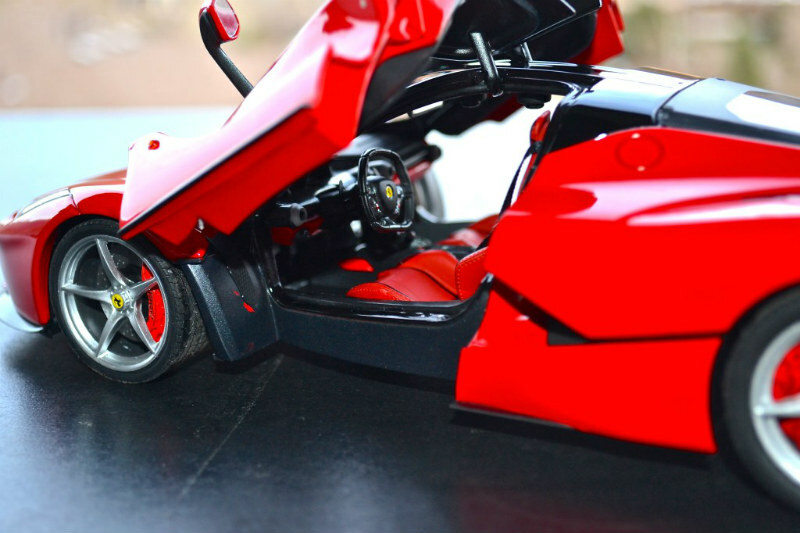 By the way why didn’t anyone review the dealer edition 1/18 Minichamps Porsche 918 Spyder (production version)? I bought it, it has a couple of negative things, but Minichamps sure improved a lot concerning quality on this model ! My DE Porsche 918 is on the water. Once it arrives I will do a review. Ah, can’t wait for the review then ! I´ve already had mine since October. Clicking my name above this reply directly links you to pictures on my website. Kraftig, if you want me to write a review, I can do so in a matter of, lets say, a day. Yes it is. 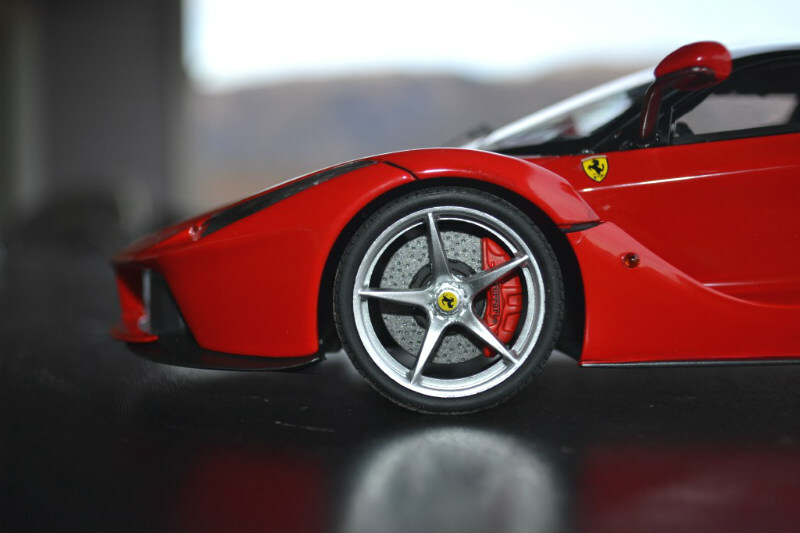 If the Red 458 Coupe is any indication this model will sell out quickly. 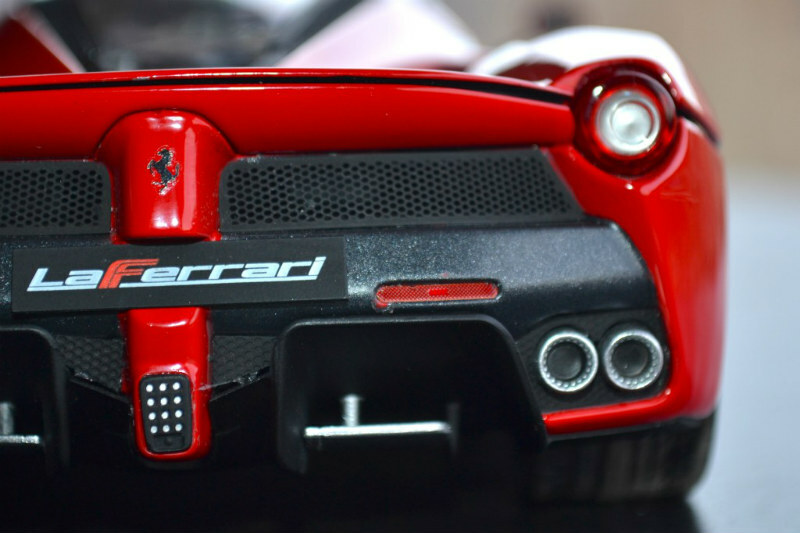 Remember the Ferrai brand appeals to more fans that just diecast collectors! thanks for the review Michael!! by looking though some assembly pictures, HW made the rear ones correct but the front and rear disks are the same(adding a hub ring on the rear should fix this) and the front is a bit off, the bottom should stick out a bit more. notice in the pic link, how..
on the model they made the surface contact area the SAME size, I’m not sure if they actually made the front diameter larger(doesn’t look like they did)-maybe Michael can check/confirm…….a bigger hub bolt ring on the rear would make the rear surface area look smaller. and maybe they could’ve made the rear caliper a bit smaller? 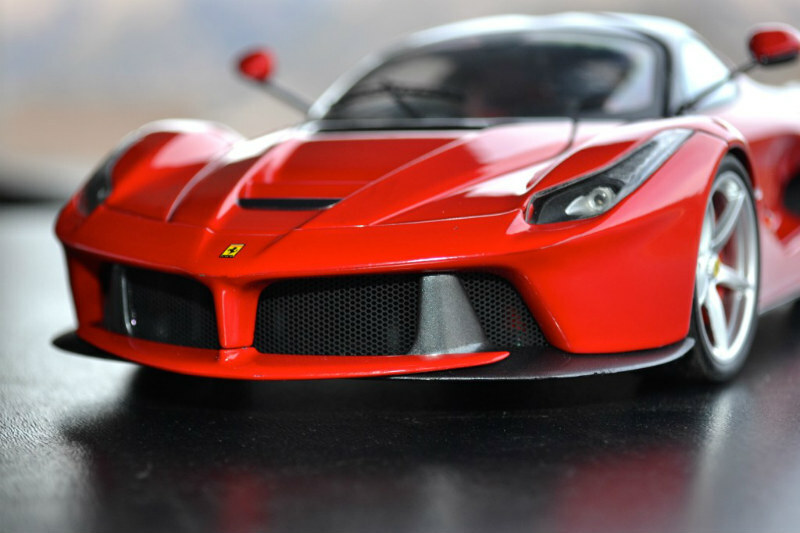 I’ve only just got collecting 1:18 models and my most expensive and highly detailed is a GT Autos Pagani Huayra in bronze, and that has perforated grilles all over the car. 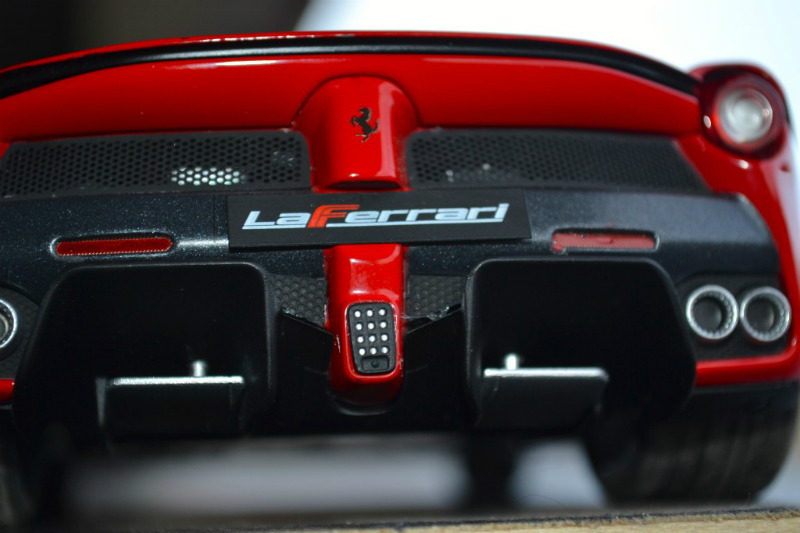 Has the LaFerrari got this? Is it perforated and is photo-etched perforated??? Hotwheels 1/18 elite is good. 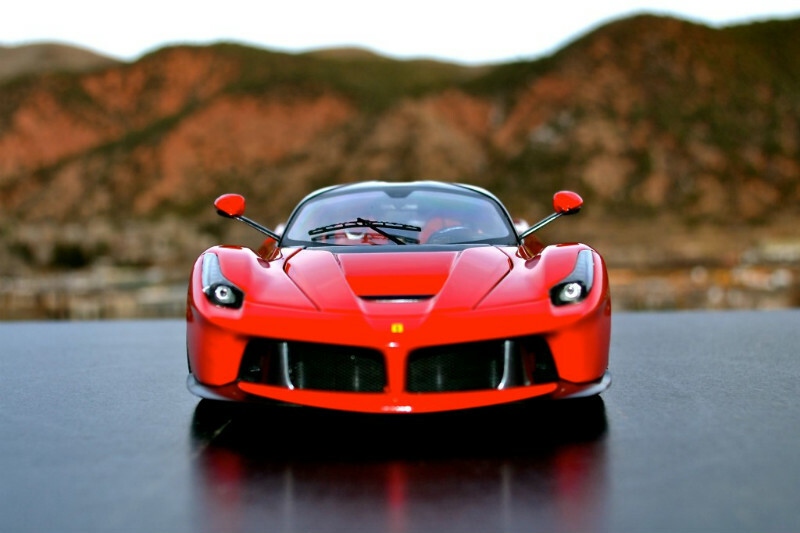 I like my La Ferrari elite, no problem with it! 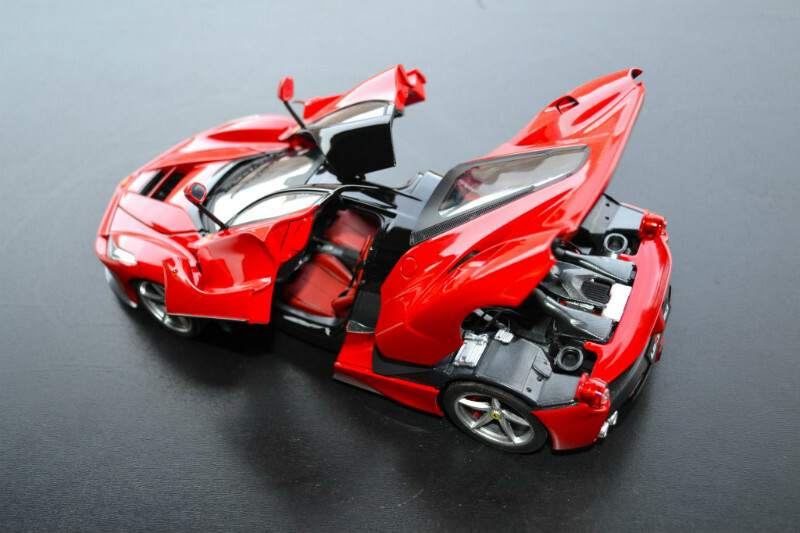 I have BBR FXX-K , it’s so nice.